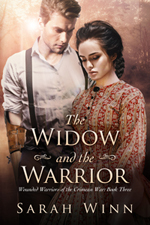 A Crimean War widow's wealthy father-in-law attempts to get custody of her five-year-old son by claiming she is an unfit mother, she agrees to a marriage-in-name-only with her dead husband's former commanding officer. He promises to keep the marriage unconsummated until the threat to her son is resolved and then allow her to get an annulment. As they live together, she sees how he struggles to overcome the handicap of a missing right arm while building a business as a horse trainer. He also befriends her son and shows her every consideration, and she begins to wonder if she wants an annulment, but he shows no interest in consummating the marriage until he's injured in a riding accident and she nurses him back to health in the privacy of his bedroom. Are his growing feelings just passion or something deeper? He sat beside her, turned to face her, but seemed to be searching for words. "Ah.it has been suggested that if you.ah.marry someone who can supply you and Toby with a secure home that would nullify Coyler's claims against you." Had she heard him correctly? "But how could I-I don't know anyone-what are you saying?" A rueful smile twisted his lips. "I am very clumsily offering to marry you. I'm not a wealthy man, but I inherited a valuable piece of land, so even if my horse business does not succeed, I will be able to provide for you." Ellen had trouble making her jaw work, but she finally managed to say, "But why would you do such a thing? We barely know each oter." "Since opening my riding academy, I've come to realize how much I need a wife. It's even occurred to me that the academy failed because parents did not feel comfortable sending their sons to a home not presided over by a woman. You saw the house. It's dark and gloomy. The servants expect me to tell them what to do, and I don't know how to do that." Ellen raised her hand in a silent objection, but he caught it and encased it with his much larger hand. "You need a husband quickly, and I need a wife. Why can't we solve each other's problems?" She shook her head in disbelief. "Surely, you must know a woman you would prefer-someone you have feelings for." "Since returning from the war, I've spent all of my time recuperating from my injuries and starting the academy. I've had very little time to socialize." He let go of her hand and looked away from her face. "And when I do, women are not attracted to a one-armed man." "Oh!" She could see how this statement embarrassed him and wanted to reassure him, to tell him he was a fine man, and many women would be honored to be his wife; but how could she do that and still refuse his proposal? "I.huh.I must tell you that Philip Coyler was the great love of my life, and I don't think I can ever love anyone else as I loved him." His head turned back toward her, his expression unreadable. "That's all right," he said. "In fact, it might be for the best. Ours could be a marriage in name only, and then, if it didn't work out, we would have the option of having it annulled." "Good heavens! I've never heard of such a thing." "Sometimes couples court for years before they marry. We would just be making it legal for us to live together during the courtship." "But would you be satisfied with such an arrangement?" "Mrs. Coyler-Ellen, many of the marriages in this world are not based on love. People marry for financial benefit or to obtain heirs or just to have someone sitting across the breakfast table from them. I am a lonely man, and you desperately need a man to protect you and your child. If you don't marry me, what will you do?" She stared into his blue eyes for a long moment pondering his question. One thing was sure to her. She would do anything to keep her child. If this gallant, big-hearted man was willing to help her do it, how could she say no? She nodded several times. He replied with what seemed to be an honest smile. She vowed to herself that she would find ways to make this up to him.